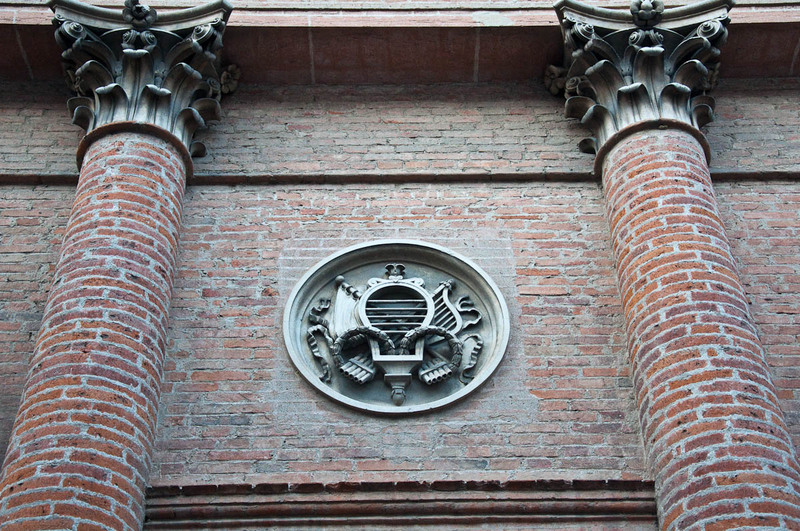 One thing I love about Italy is its abundance of places off the beaten track which (excuse the verb, but honestly there isn’t a better one in this case) blow you away with their architecture, beauty and centuries-old traditions. Yes, while thousands of people push each other and swelter under the unforgiving Italian sun to see a masterpiece or two in a handful of cities overrun with tourists, the whole of Italy houses hundreds, if not thousands of lovely little towns where you can enjoy it all – priceless art, amazing food and gorgeous scenery – at your leisure and without the stress induced by the mass travel of today. 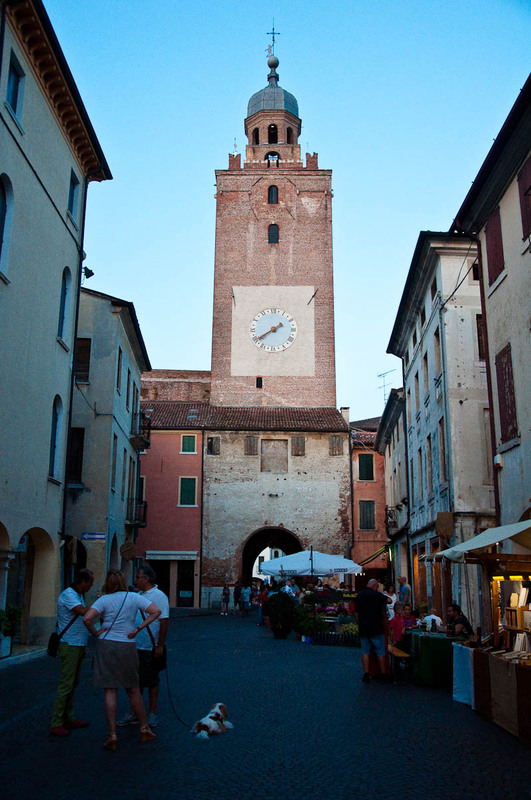 A gem of a medieval walled town in the Northern Italian region of Veneto. I have been dying to tell you all about it for quite some time now, but, at the same time, I have been wanting to keep it all for myself. Yes, all! 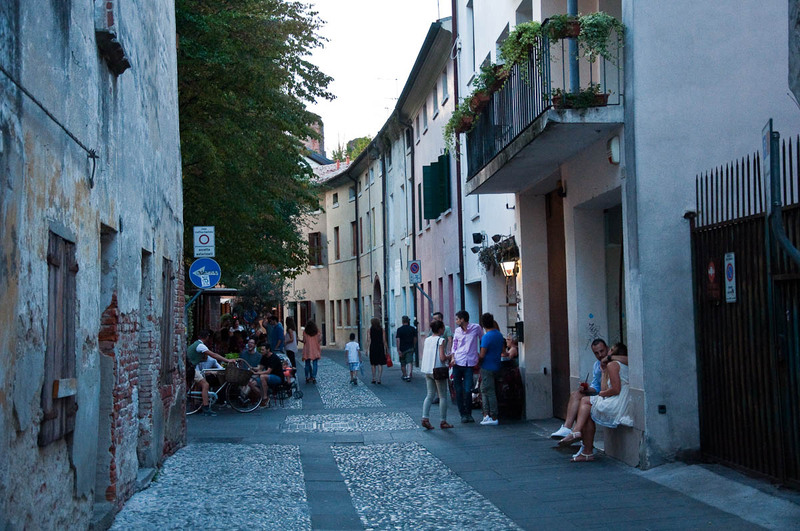 The mighty wall circumnavigating the town’s historical centre, the old houses with their faded frescoes, the tall tower with a splendid panorama and the cafes and restaurants with large outdoors seating areas buzzing with people late in the balmy evenings. 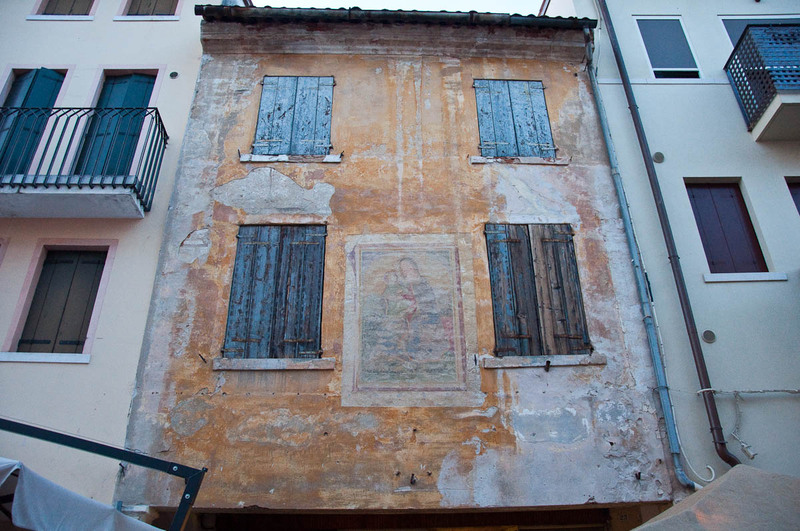 Take all of this and add to it the fact that the renowned Renaissance painter Giorgione was born in Castelfranco Veneto and you will know that you are onto a good thing. 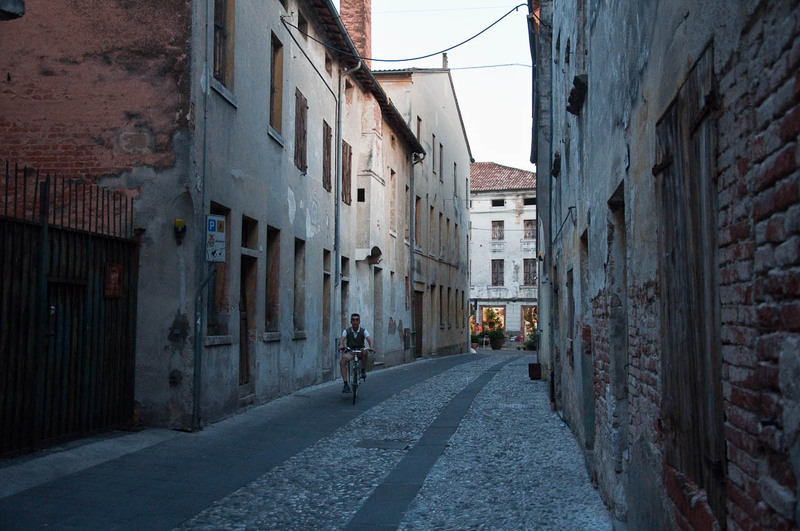 We have taken every opportunity to pop down to this charming town which happens to be just about 30-40 minutes (depending on the size of your car) away from Vicenza and only about ten minutes down the road from another one of our local favourites – Cittadella. 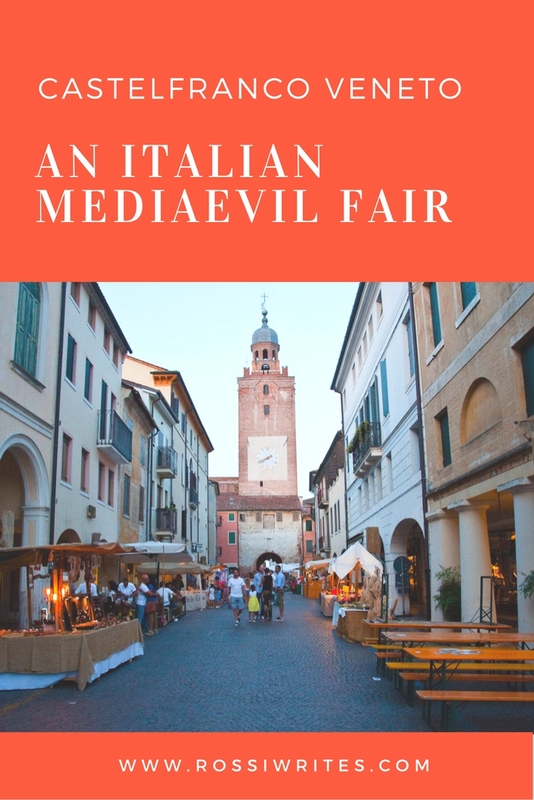 So, when last Saturday I noticed a small listing on a local website announcing that a two-week long Medieval Fair was taking place in Castelfranco Veneto, we didn’t even debate if we should visit or not. In the late afternoon, we simply piled in our little red car and drove off into the distance. About forty minutes later we were pulling in the large car park in the shadow of the mighty medieval wall and right opposite Giorgione’s statue. Yes, even our little red car (more used to multi-story car parks back in England) is living it up here in Italy in terms of views, art/history and locations. The cafes and the restaurants were abuzz and elegantly dressed men and women were milling in and out of them. We followed the street leading from the car park with the splendid view through the medieval defensive wall and right into the heart of the small picturesque town. Immediately a curious scene revealed itself to us. Well, to be perfectly precise, I need to clarify that we heard it before we saw it and we were so intrigued that we stood glued to our spot right by the local theatre’s building to see what was going on. 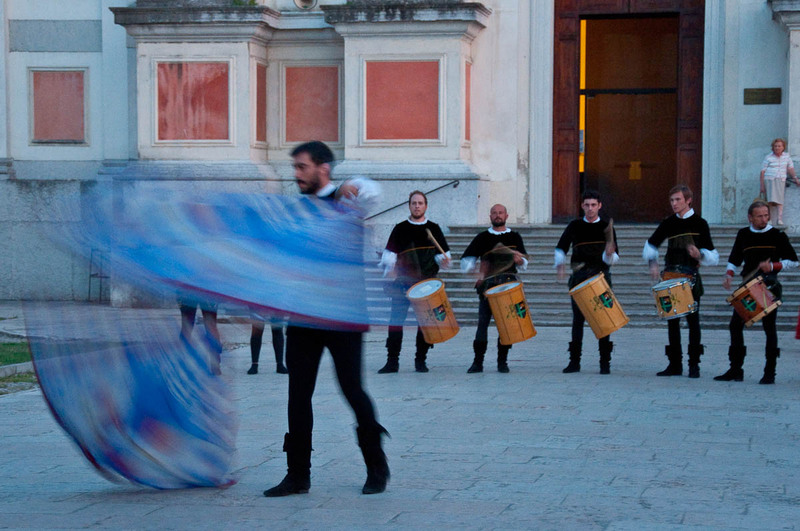 The rhythmic sound of drums, loud and clear, was mingling in the warm air with the solemn echo of the fanfares. 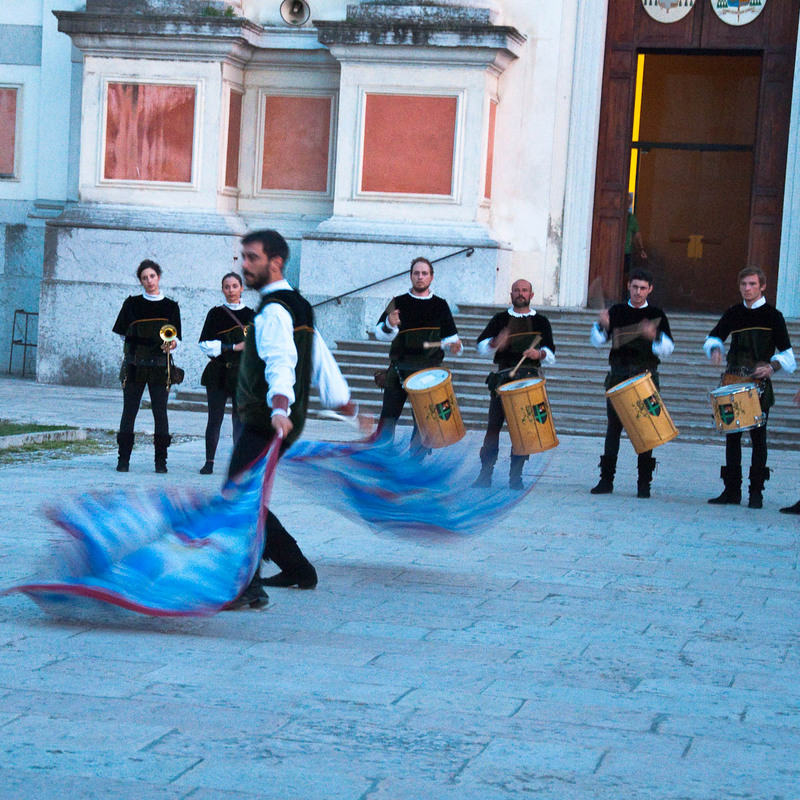 The music grew louder and nearer, until we saw them – the members of a medieval marching band advancing towards us through the town’s narrow curving streets. Passers-by, just like us, had stopped in their tracks to appreciate the moment. The band passed us by and with heightened spirits we continued exploring. Immediately, we noticed the utmost dedication to detail. 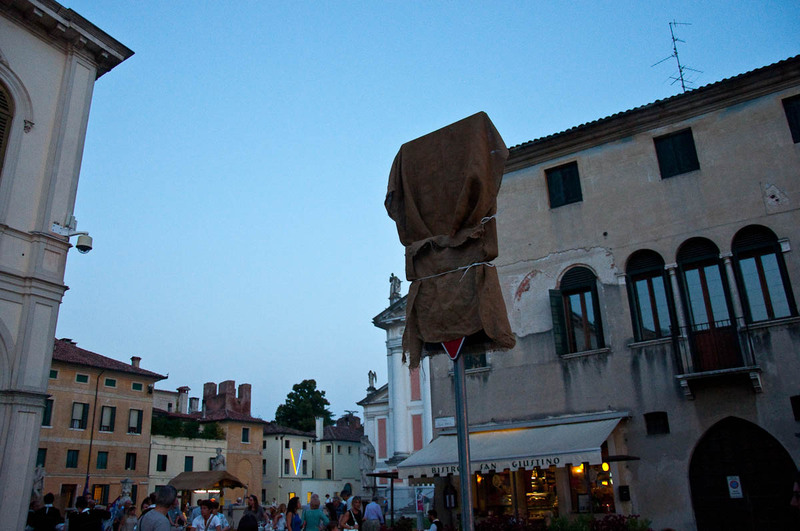 In an effort to emphasise the town’s medieval feeling, all traffic signs and other such signage along the streets had been covered and/or tightly wrapped with hessian cloth. I could only appreciate the effort the organisers had gone to. 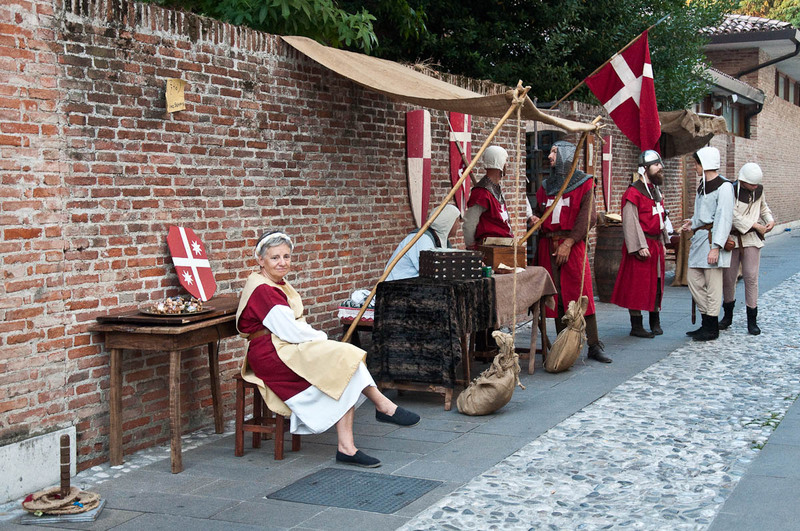 Along Castelfranco Veneto’s main street a medieval market had been laid out with all traders dressed in full costume and selling handmade wares in the tradition of a bygone era. 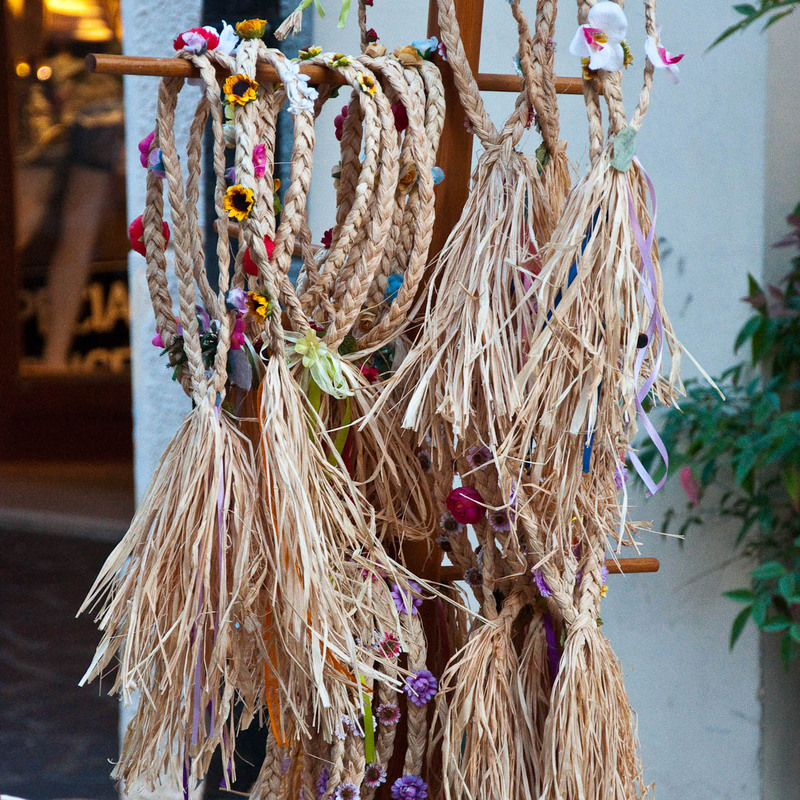 For example, you could buy a headband artfully plaited out of straw, a thick long cape or handwoven shawls. 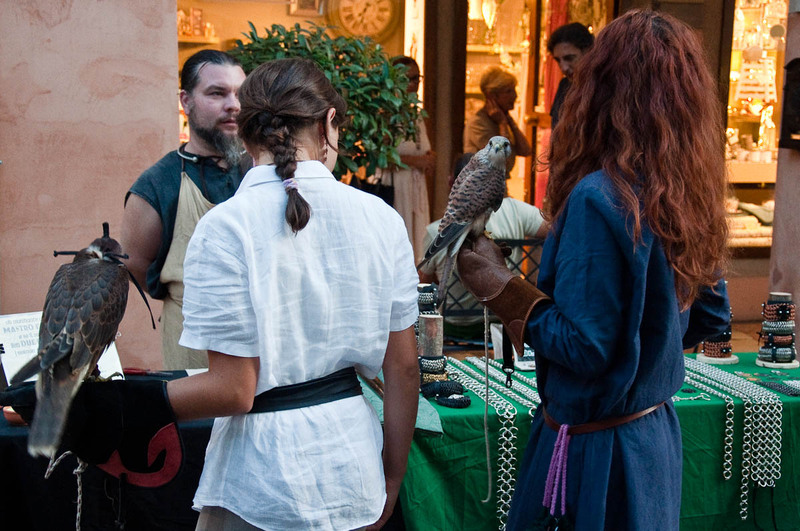 Two ladies carrying their faithful falcons were shopping for chainmail jewellery. 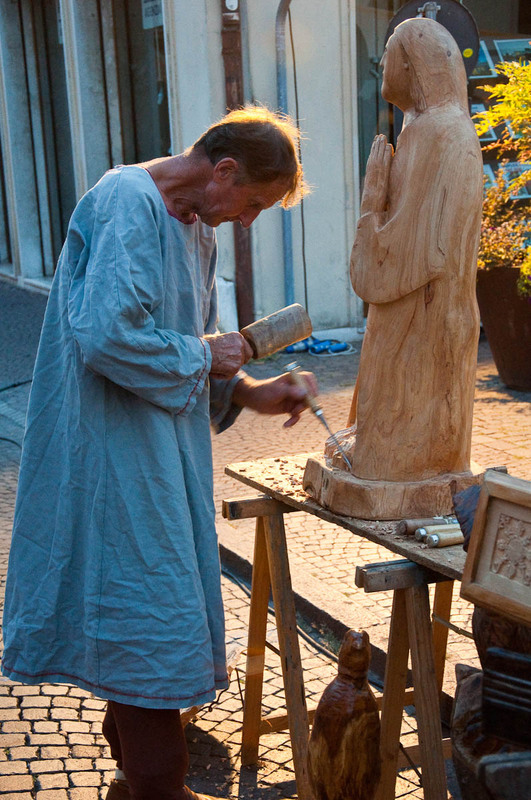 A woodworker was putting the final touches to a handcarved statue of a saint. and then had a little chat with a lady nimbly weaving bracelets out of colourful threads. By coincidence she turned out to be the secretary of the association which organises one of the biggest medieval local events which I had already told you about in a previous blog post – La Faida – held on the 1st May each year at the Romeo’s and Juliet’s Castles just above the nearby to Vicenza town of Montecchio Maggiore. 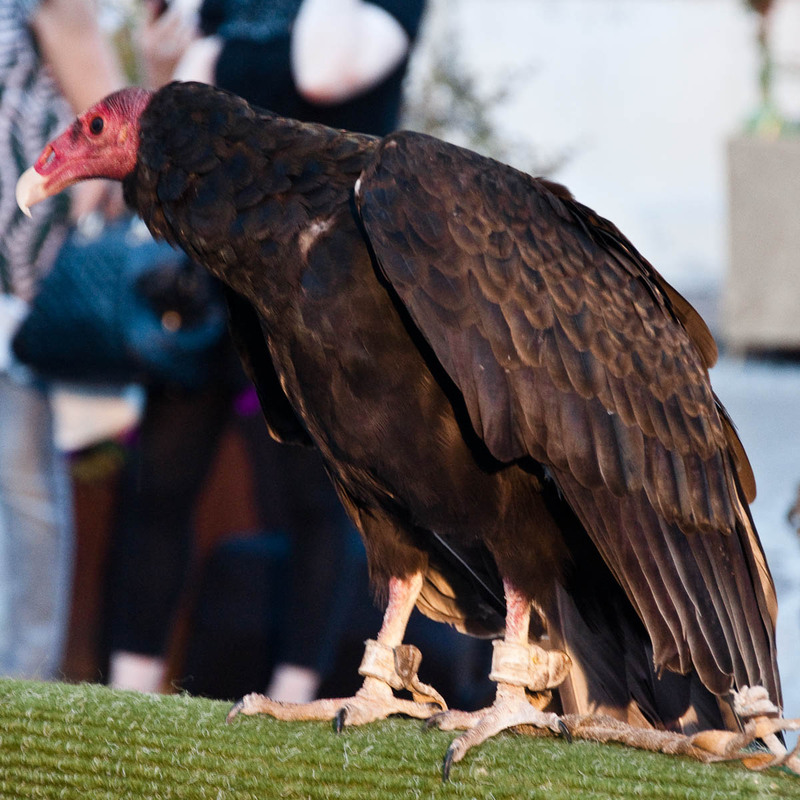 And then we spotted a large cordoned off area occupied by lots of birds of prey. 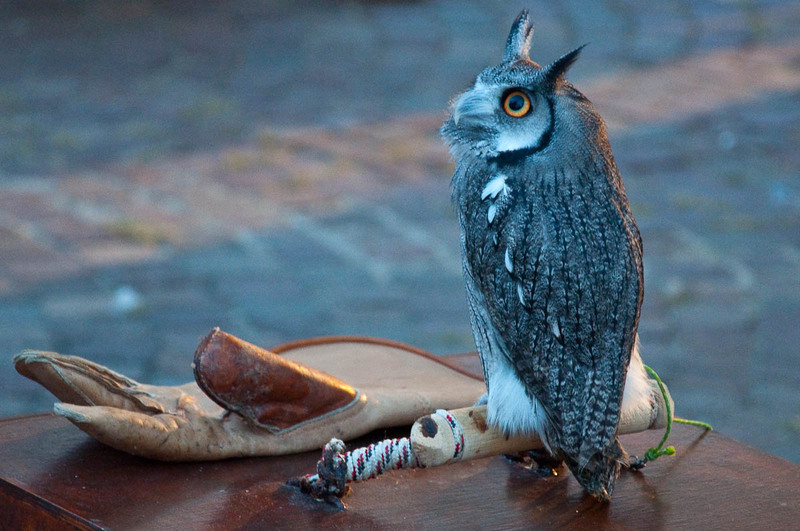 There were some amazing owls, both so cute and fluffy, I couldn’t help it but fall in love with them. There were also several falcons and kestrels, plus a huge black vulture with a featherless red head, which looked a bit weird yet so regal. 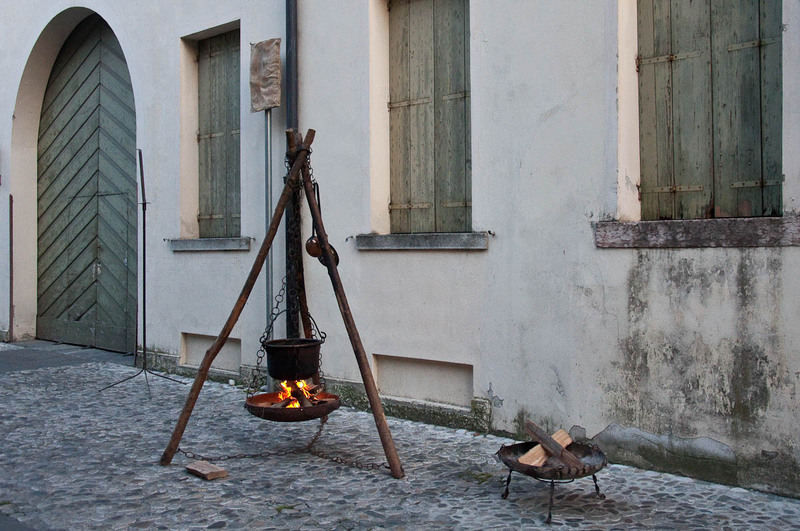 In the nearby streets more stalls had been set up showcasing typical medieval games, archery, chainmail armour and other such curious and compelling artifacts of a lifestyle long gone by. We had a lot of fun trying out the different games, encouraged by the kind ladies dressed in medieval garb. Our favourite game turned out to be the wallnut-crasher. I gave it this name, so, no, it is not a medieval term, I am afraid. Basically, you had a long, curving tube which opened right above a wooden stump. The lady manning this medieval installation would drop a wallnut in the long thin tube and you had to listen for it rolling through the tube and then hit it with a heavy hammer and smash it to smithereens as soon as it had dropped from the tube onto the wooden stump. No, it was not easy! But after a few attempts and lots of laughs, we succeeded to smash a walnut. I mean, my husband did and I cheered him loud. It was quite late and dark by then, so no pictures, sorry! But earlier in the afternoon, I managed to take a nice photo of this game which was also really cool. 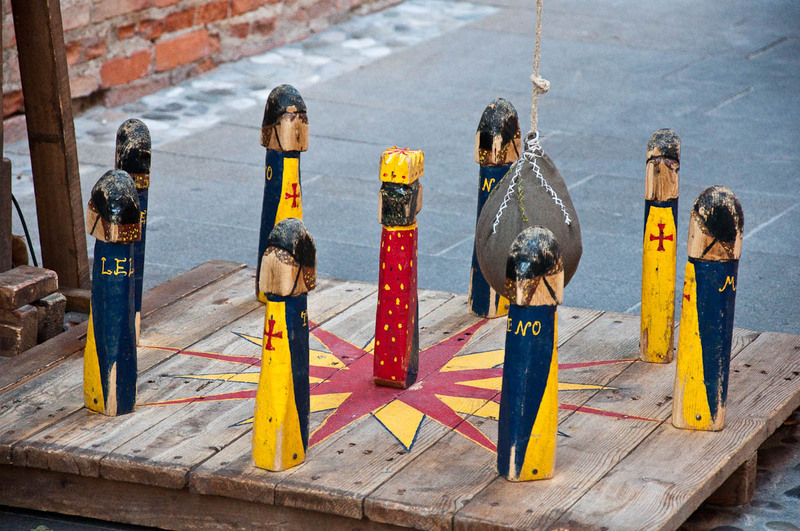 Basically, you had to knock off all the knights standing in a circle surrounding the central figure – called ‘the queen’ – before knocking off the queen last right at the very end of the game. Again, it wasn’t easy. You could quite understand how this type of tricky games would occupy a large chunk of time in an era when a smartphone or a tablet would have been inconceivable. The most compelling place we saw turned out to be the booth where you could try your hand at axe-, spear- and/or dagger-throwing. Funnily enough there were mainly ladies in the queue willing to master their handling of an axe or a dagger. We watched for quite some time their attempts to throw an axe so hard that it got wedged in the wooden planks covering the rear portion of the booth. A feat which required a very strong decisive throw which some of the ladies demonstrated rather well. It was all so full of atmosphere! Just looking at the people in full costume all around us, I could easily imagine finding myself hundreds of years back in time. It was quite dark by then and here and there long tables had been set up straight on the pavements. 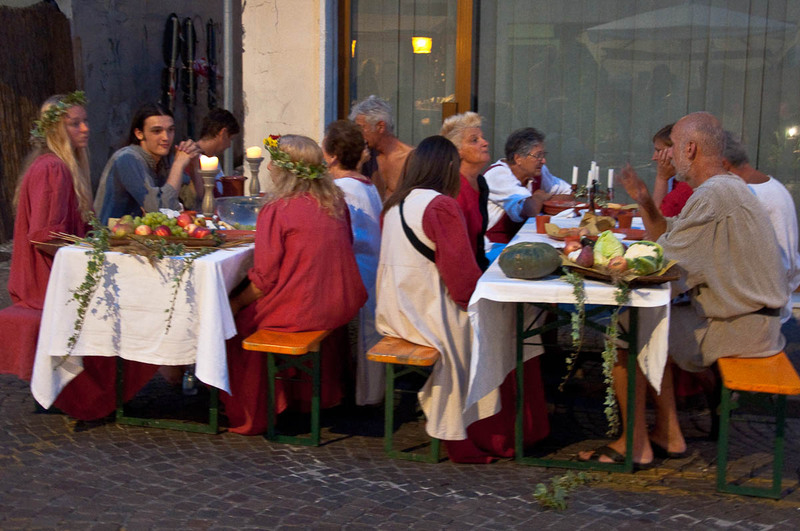 The participants in the Medieval Fair took their places around the tables in order to feast on epoch-appropriate food. 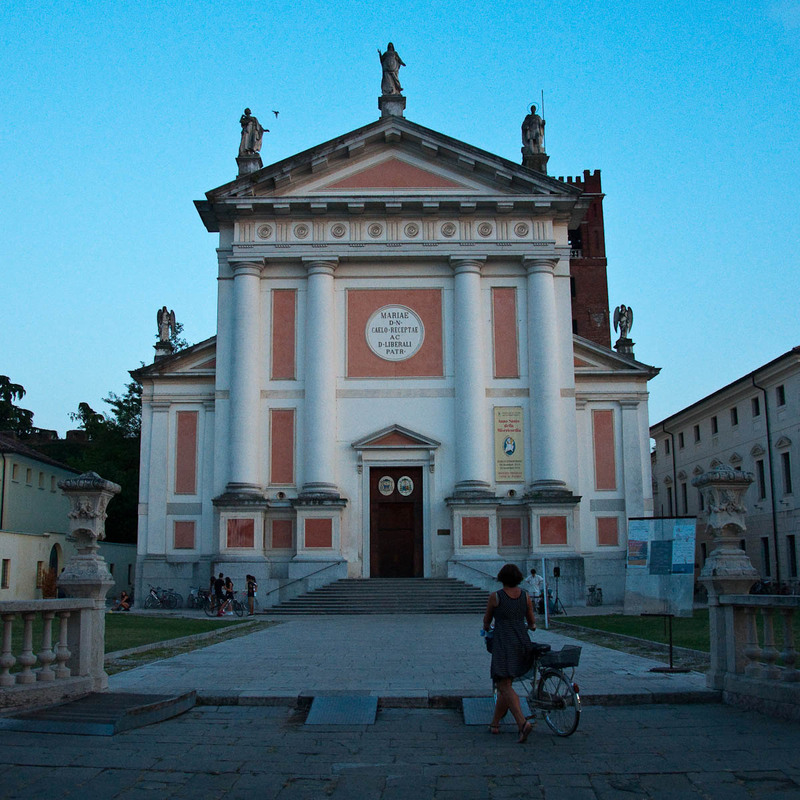 We heard the rhythmic call of the drums again and followed their sound straight to the Duomo – the big pink church in the heart of Castelfranco Veneto, to the right of which still stands Giorgione’s former home now turned into a museum housing some of his works. In front of the church a medieval band was playing. 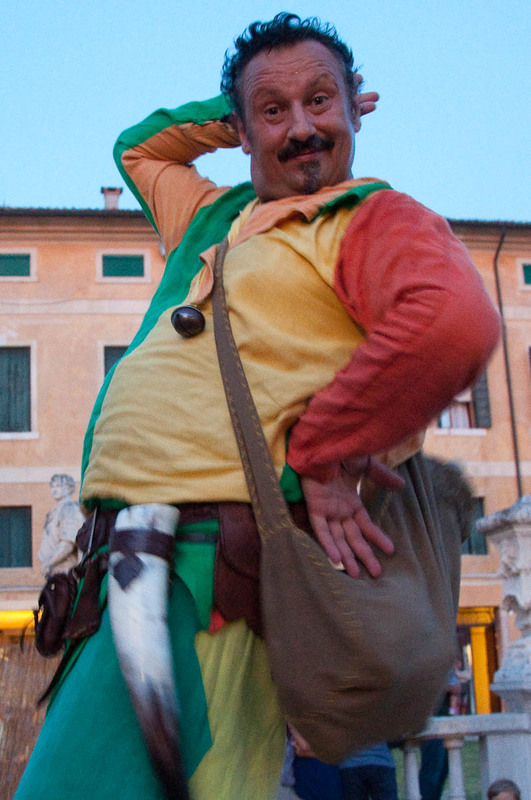 A joyous man on long stilts was entertaining the crowds and took a huge delight in posing for me to take his picture. Then a group of young men showcased some serious flag throwing skills. Flag throwing is a big thing in Italy. Dating back to medieval times it is the art of tossing and catching a flag with your hands and/or feet in a myriad of visually pleasing ways. It requires some serious skills and dexterity and it is always so compelling to watch. By that point it was already quite dark (yes, the days are getting shorter here). The crowd of people had grown, but it was nothing like the craziness I had observed in proper touristic places here in Italy. No shoving, no pushing, no tourists outweighing the number of the locals. It was all so peaceful and relaxed, with local people out to enjoy the fair with pets and children. It was a truly great evening for us, too. 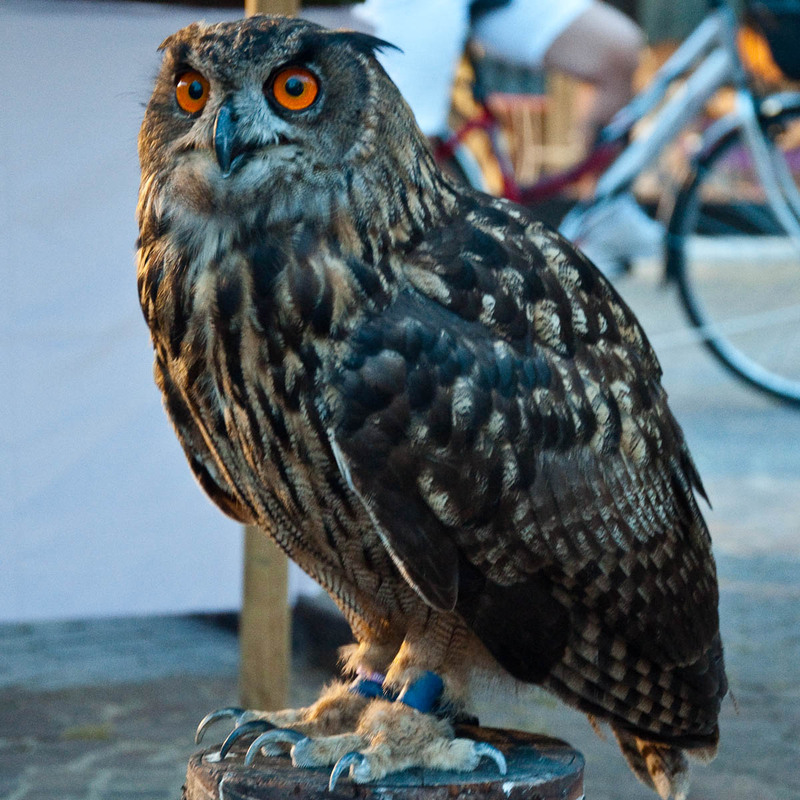 We spoke to so many of the people taking part in the Medieval Fair. You could tell how proud they were of their heritage and how happy they were to explain how the different games worked or what skills a particular craft required. After we tried our hand at several of the medieval games all the while laughing so much over our lame attempts to master them, the ladies in charge of the game portion of the fair gave us a potted succulent plant as a lovely memento of a great evening. 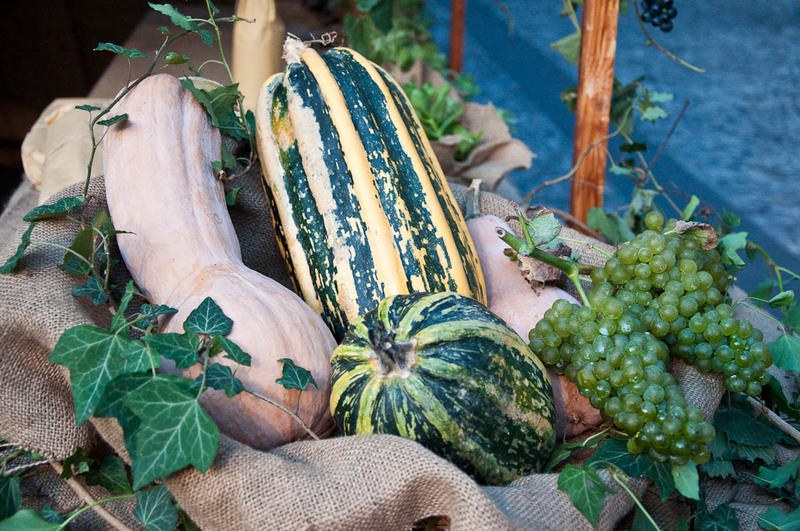 It is now taking a pride of place on our kitchen windowsill and reminds me of an authentic memorable evening – one of the best we have had here in Italy. 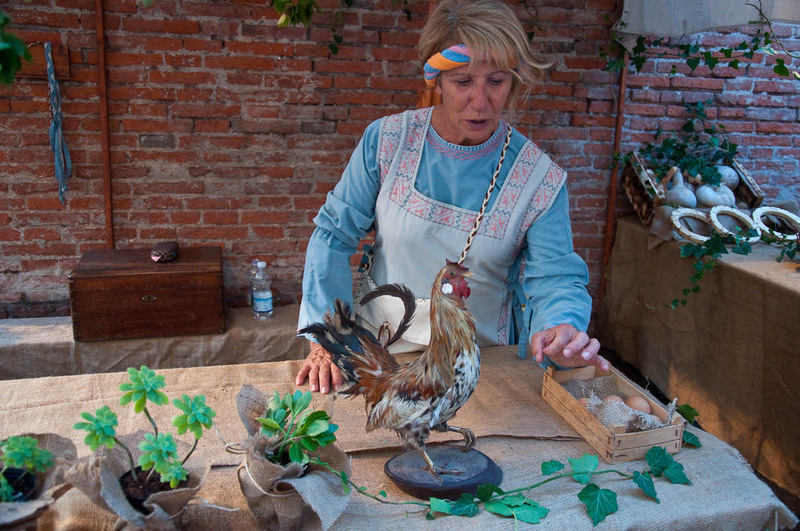 Now, the good news is that the Medieval Fair continues in Castelfranco Veneto this coming weekend (11th and 12th September), too. Plus on Sunday is the biggest highlight of the event – a splendid Medieval Parade with knights (some on horses! 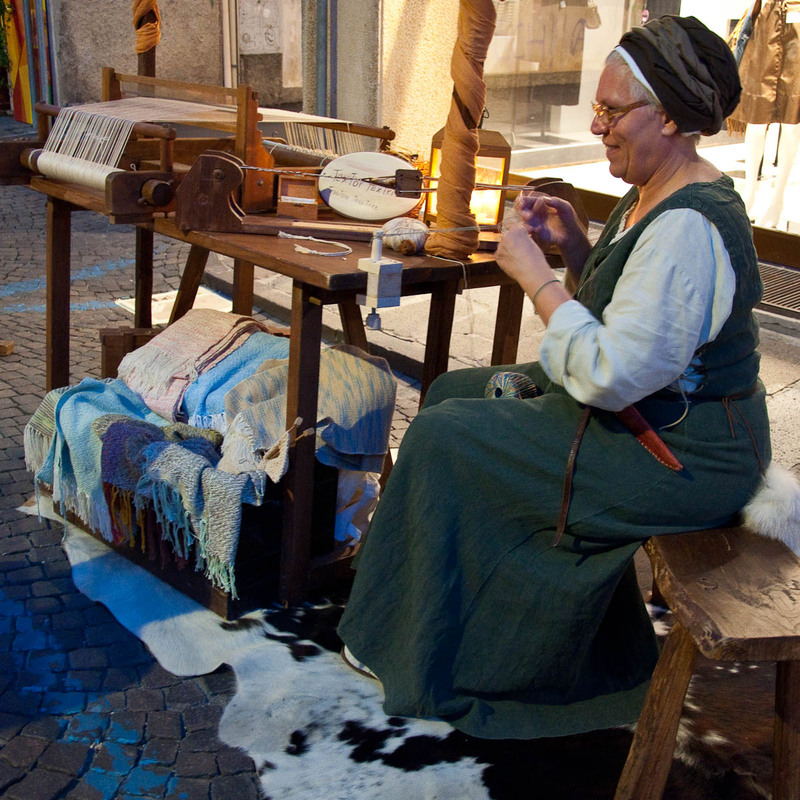 ), dames and wenches will take to the streets of the town. 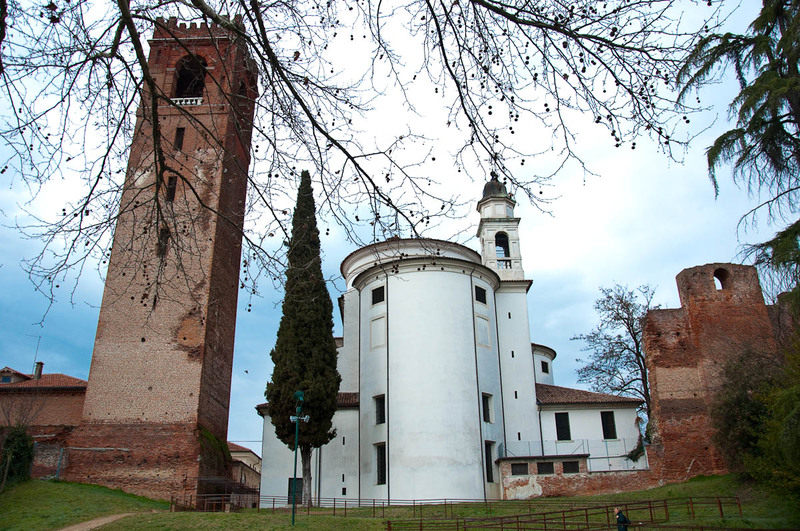 If you can’t make it to Castelfranco Veneto this weekend, don’t despair! 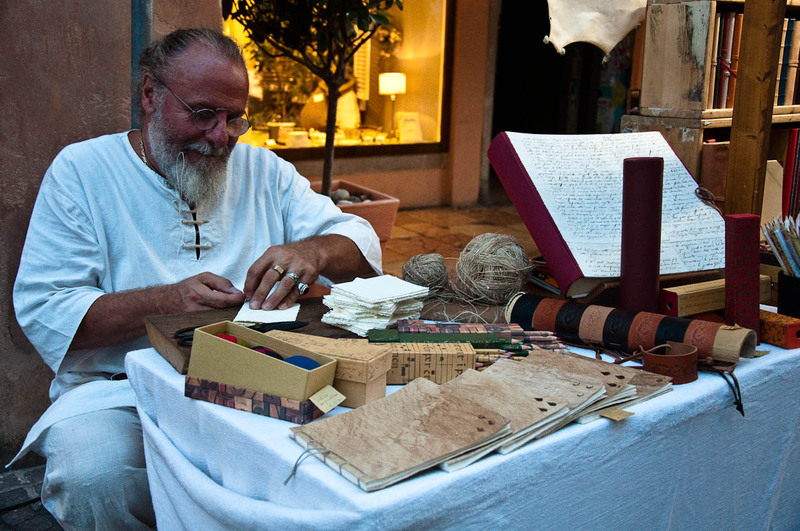 Just remember when you next come to Italy, to spend a day or two (or as many as you can, in fact) exploring this beautiful country off the beaten track in search of its real traditions undiluted by a relentless tourist flow. What is your travel style? 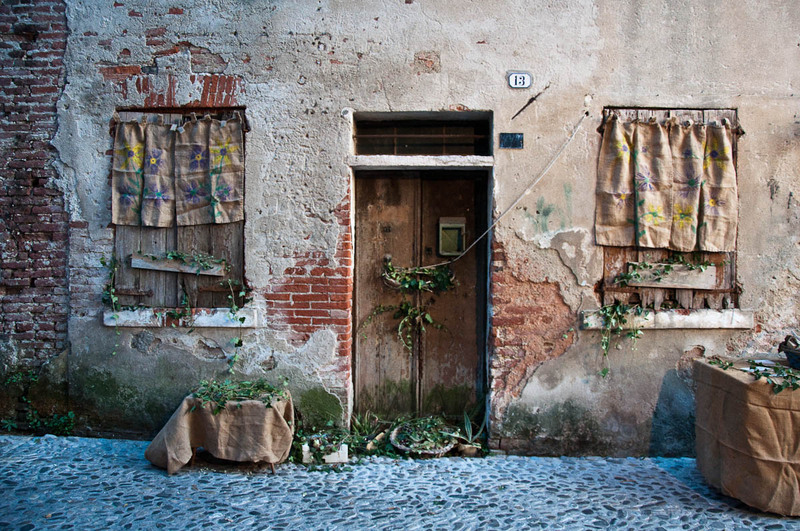 Do you prefer to visit places off the beaten track or would you rather spend time in the most popular cities? Let me know in the ‘Comments’ section below. I love reading your opinions. I definitely adore places off the beaten track to the others. Rossi, amazing pictures. They maid me feel as if I were there!